Click the thumbnail picture to see a larger version of the picture, then use your browser BACK button to return to the original page you were viewing. 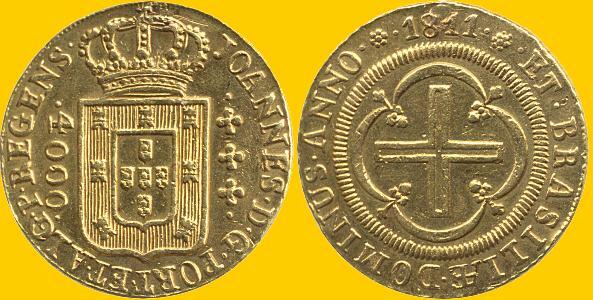 The obverse has the crowned Portuguese coat of arms. The legend JOSEPHS-I-D-G-PORTUG-REX (Joseph I By Grace of God King of Portugal) encircles them. The reverse has a cross within a quatrefoil with the date ANNO 1773 above and the legend ET-BRASILE-DOMINUS (and Lord of Brazil) encircling the cross. The obverse has the crowned Portuguese coat of arms. The legend JOANNES-D-G-PORT-ET-ALG-REX (John King of Portugal) encircles them. The reverse has a cross within a quatrefoil with the date ANNO 1811 above and the legend ET-BRASILIÆ-DOMINUS (and Lord of Brazil) encircling the cross. THis coin is the small crown variety which was minted at the Rio de Janeiro mint. The obverse features a bust of Emperor Dom Pedro II (b1825-d1891). The Latin legend PETRUS II D.G.IMP. ET PERP.BRAS.DEF (Peter II by Grace of God Emperor and Perpetual Defender of Brazil) surrounds the bust. The date 1851 is below the bust along with the date 1875. The reverse has the Imperial arms with the Latin legend IN HOC SIGNO VINCES (In This Sign, You Will Conquer) around the top. The obverse features a bust of Emperor Dom Pedro II (b1825-d1891) with the Latin inscription for PETER II BY GRACE OF GOD CONSTITUTIONAL EMPEROR AND PERPETUAL DEFENDER OF BRAZIL around the bust and the date 1853 below the bust. The reverse has the royal coat of arms with the Latin motto above meaning IN THIS SIGN YOU WILL CONQUER. Peter was the last emperor of Brazil as Brazil declared itself a republic in 1889. The obverse features a bust of Emperor Dom Pedro II (b1825-d1891). The Latin legend PETRUS II D.G.IMP. ET PERP.BRAS.DEF (Peter II by Grace of God Emperor and Perpetual Defender of Brazil) surrounds the bust. The date 1855 is below the bust along with the date 1875. The reverse has the Imperial arms with the Latin legend IN HOC SIGNO VINCES (In This Sign, You Will Conquer) around the top. The obverse features a bust of Emperor Dom Pedro II (b1825-d1891). The Latin legend PETRUS II D.G.IMP. ET PERP.BRAS.DEF (Peter II by Grace of God Emperor and Perpetual Defender of Brazil) surrounds the bust. The date 1858 is below the bust along with the date 1875. The reverse has the Imperial arms with the Latin legend IN HOC SIGNO VINCES (In This Sign, You Will Conquer) around the top. The obverse features a bust of Emperor Dom Pedro II (b1825-d1891). The Latin legend PETRUS II D.G.IMP. ET PERP.BRAS.DEF (Peter II by Grace of God Emperor and Perpetual Defender of Brazil) surrounds the bust. The date 1866 is below the bust along with the date 1875. The reverse has the Imperial arms with the Latin legend IN HOC SIGNO VINCES (In This Sign, You Will Conquer) around the top. The obverse features a bust of Emperor Dom Pedro II (b1825-d1891). The Latin legend PETRUS II D.G.IMP. ET PERP.BRAS.DEF (Peter II by Grace of God Emperor and Perpetual Defender of Brazil) surrounds the bust. The date 1889 is below the bust along with the date 1875. The reverse has the Imperial arms with the Latin legend IN HOC SIGNO VINCES (In This Sign, You Will Conquer) around the top. The obverse features a bust of liberty surrounded by the country's name in Portuguese REPUBLICA GOS ESTADOA UNIDOS DO BRAZIL. Ther reverse has the arms featuring the Southern Cross constellation enciercled by the Portuguese legend ORDEM E PROGRESSO (Order and Progress) and t5he founding date of the republic, 15 DE NOVEMBRO DE 1889. The obverse features busts of Dom Pedro II Dom Pedro II (b1825-d1891), first emperor of independent Brazil and Gen. Emilio Garrastazu Medici (b1905-d1985), the military president in 1972 with the country's name BRASIL to the left and a stylised 1822-1972 below. The reverse has a map of the country with the new capital Brasilia pinpointed and the denomination 300 CRUZEIROS below.